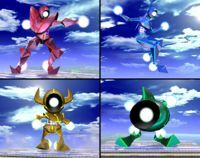 The Fighting Alloy Team makes an appearance in Super Smash Bros. Ultimate as a Spirit. Wii Super Smash Bros. Brawl A member of the Fighting Alloys. This one's sporting a red body. Built like an everyday hero, he fights like one too. Typically, when groups are divided into colors, red tends to serve a leadership role. Although this does not necessarily apply to the Alloys, the Red Alloy somehow feels the need to step it up. Wii Super Smash Bros. Brawl A beautiful, cobalt blue member of the Alloys. This dainty female-form Alloy relies on a less rough-and-tumble style of fighting. The core at the center of her body provides power for the whole group of Alloys and plays a key role in holding body parts together. However, this is not necessarily a weak point, and attacking this core will not result in greater damage. Wii Super Smash Bros. Brawl A member of the Alloys who stands out from the bunch with a sharp yellow body and horns. He moves like Mario but is bigger and has a longer reach. He can't, however, use items or special moves. Also remember that he is not controlled by a human player, so this is your big chance--show him who's boss! Wii Super Smash Bros. Brawl The guy who clearly has the biggest head of all the Alloys. In fact, he's all head! When you face him in the 100-Man Brawl, he'll come at you in a group with other Alloys. While kicking around herds of these bad boys can be good fun, the highest-difficulty Brawl challenge is brutal--the Green Alloys will come at you like merciless demons! Even though the Yellow Alloy's trophy says they cannot use items, if they run into a Starman, they become invincible. This is primarily because not all items can be grabbed. ↑ Nintendo World Report TV. (November 19, 2018). Super Smash Bros Ultimate World of Light and Spirit Board Preview. YouTube. Retrieved November 22, 2018. This page was last edited on December 27, 2018, at 02:38.